Seeing a durian in a box while at a party, a man tried to pick it up to take a deeper whiff at his favourite fruit. To his great surprise and distress, his hands didn’t meet the thorny spikes he had expected, but went right into the durian, ruining the beautifully crafted 3D cake. That’s a true incident by the way, and whether he is still invited to parties is a question for another day. This magnificent 3D durian cake is the brainchild of Matthew Yap, who runs the Songket Artisan Bakery company with his wife Helen Wong. Wong is the baker, but credits her husband for first conceiving the idea to make a 3D durian cake for an aunt’s 85th birthday celebration. 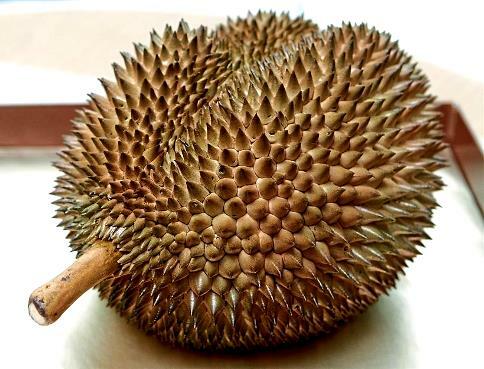 “My aunt loved durians. I wanted to make not just any durian-flavoured cake for her, but one that looks and tastes just like the real fruit,” says Yap. Wong baked the cake and Yap took charge of the decoration. 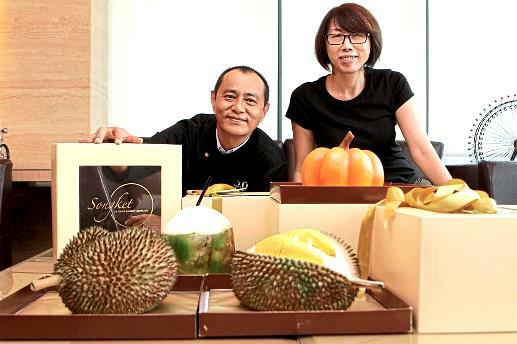 He bought durians and placed one right in front of him as a reference as he crafted the cake. It took two days for Yap to complete his first of many 3D durian cakes. “My aunt loved it and so did everyone else. And that was how it all started,” says Yap. That was four years ago. He quit his job in the printing line and helped Wong at their small bakery, specialising in not just making the durian cakes, but other 3D cakes as well. The business quickly took a life of its own when business incubation centre Tricor Hive approached the couple for a joint venture. Now Yap and Wong produce their cakes exclusively under the Songket Artisan Bakery company. The cakes are baked at the central kitchen in Cheras and sold at TwoJ Business Lounge in Bangsar South. The durian and other 3D cakes must be pre-ordered online or at the store. The cakes can then be picked up from there or sent to various locations within the Klang Valley. It takes at least two days to make a durian cake. The completely handcrafted cake is built from scratch in stages. The core of the durian is a chiffon cake baked in a regular round mould. It is then layered, filled, shaved and shaped to form the durian fruit. “It is a really difficult cake to make; I spend a crazy amount of time on getting each cake just right,” he says. Their durian cake looks so much like the real deal that they were even denied entry into a hotel when making a delivery run. The security personnel thought that they were trying to sneak the prohibited item into the premises. The durian cake also smells like the king of fruits. The only way it fails to pass off as the real fruit is that its thorns aren’t prickly. They may look sharp, but the slightest touch could ruin the entire cake. The frosting isn’t made of fondant – which comes as a surprise to many people. The cake is covered entirely with fresh cream, patiently piped in different shades to create the uneven and pointy tips. It is then airbrushed over to create layers of colours to mimic the shades of a durian. The cakes are packed in an ice box during delivery. This could hold the cake for about three hours; anything longer than that would result in a melt-down. “We had customers asking us to send the cakes over to Penang and Singapore. We don’t recommend such long journeys because the cakes would definitely not hold their shapes until they reach the destination,” says Yap. The cake is best kept in a chiller between 0°C to 4°C if not consumed immediately. But it can also be kept in the freezer for up to three days. “Of course we want our clients to eat the cake as soon as possible so that the taste would not be compromised,” says Yap. Now, as much as you want to “open” it the way you would a real durian, it is best to cut it like a cake. Inside, you’ll find soft chiffon cake with layers of D24 durian flesh and fresh cream. At RM238, this 1kg cake is worth every sen, and that is coming from a non-durian lover. Although Wong and Yap get lots of practice with the 300 to 400 orders they meet a month, the process of making each of the cake has not gotten easier. “It is still a tedious process, but we work faster now because we know what to do,” he says. Besides the whole durian cake, they also make the open-faced Musang King durian cake. 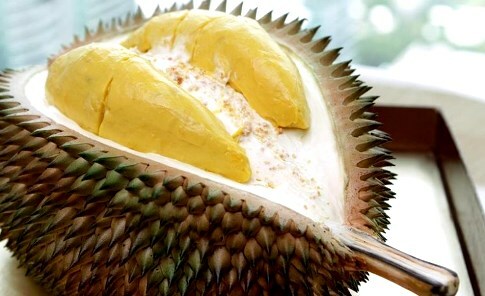 It is priced at RM398 and comes with Musang King durian flesh formed to look like the real, untouched flesh on top. The cake weighs between 1.3kg to 1.4kg. Both durian cakes have stems made of chocolate. They source for the durians from farms all over Malaysia, but especially from Raub, Pahang. They have a special machine that separates the flesh from the fruit, which allows them to store the durian flesh in a refrigerator. This ensures they have ample supply of durian for all their orders, even during the off-season. Currently, they only use D24 and Musang King durians. “The whole durian cake is made with D24 durians, and the open-faced ones are with Musang King,” stresses Yap. And that’s that. “If we give too many options, it would become too difficult for us to fulfill the orders. Right now, we have the process and amount of ingredients down pat for these two varietals. Any change would affect the end product,” says Yap.